President Donald Trump said Tuesday in a White House meeting with Democratic congressional leaders that he would be "proud to shut down the government for border security." 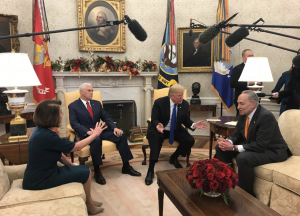 In an unusual Oval Office display in front of the cameras that lasted nearly 17 minutes, Trump, Senate Minority Leader Chuck Schumer (D., N.Y.) and House Minority Leader Nancy Pelosi (D., Calif.) debated over a spending bill that would address border security and Trump's long-promised border wall. "I would like not to see a government shutdown," Trump told reporters before a sparring match broke out. "We will see what happens over the next short period of time. The wall is a very important thing to us … Border security is extremely important." Pelosi has said she will not agree to any border wall money in a Department of Homeland Security funding bill. She and Schumer planned to offer Trump a deal to pass appropriations bills for six agencies, along with a year-long measure to keep DHS funding at current levels, according to NBC News. If Trump denied that agreement, the Democrats planned to suggest a yearlong continuing resolution for all unfunded departments. Schumer said there was a good continuing resolution with bipartisan support that wouldn't shut down the government, but Trump said he wouldn't take it without good border security funding. "It is very good border security," Schumer said. "Where you have walls, Chuck, it's effective," Trump said, adding without border security, the government would partially shut down. He's also said he'll use the military to build the wall if necessary, and he also said portions of the wall were already built, which the Washington Post has called a false claim. Schumer called the wall wasteful, while Pelosi mourned the conversation had "spiraled downward." Trump reminded Schumer that Democrats shut down the government in January, but he finally promised to own any government shutdown if he didn't get the funding he wanted. "I am proud to shut down the government for border security, Chuck," Trump said. "The people of this country don't want criminals and people that have lots of problems and drugs pouring into our country, so I will take the mantle. I will be the one to shut it down. I'm not going to blame you for it. The last time you shut it down, it didn't work … I'm going to shut it down for border security." Vice President Mike Pence remained silent throughout the encounter, which Pelosi repeatedly suggested should not play out in front of the press. The Democrats also appeared to rile up Trump after discussing their takeover of the House in the midterms, with Trump noting "we won the Senate." Schumer snarked: "When the president brags that he won North Dakota and Indiana, he's in real trouble." "I did," Trump said. "We did win Indiana and North Dakota." Afterward, Schumer told reporters outside the White House that if Trump stuck to wanting a $5 billion wall, he would get no wall and a shutdown.